Russia-backed militant groups continued intense attacks involving Minsk-proscribed weapons yesterday: they conducted a total of 26 precision attacks on Ukrainian, reported Ukrainian Ministry of Defense spokesman on ATO Colonel Andriy Lysenko at a press-briefing at Ukraine Crisis Media Center. Ukrainian troops returned fire 16 times using weapons not proscribed under the Minsk agreements. In Luhansk sector, militants committed 17 ceasefire violations. Russian proxies fired twenty 152-mm artillery rounds on Ukrainian positions near Prychepylivka. “Russian proxies made precision attacks in the area of Troitske using 82-mm and 120-mm mortars, as well as tank and IFV mounted weapons. Moreover, they used 82-mm mortars near Krymske, Novooleksandrivka, and Luhanske,” added the spokesman. Russia-backed militants also used various grenade launchers and small arms in the area of the above towns as well as near Zaitseve, Donets, Zhovte, Svitlodarske, Novotoshkivske, Stanytsia Luhanska, and Bohdanivka. 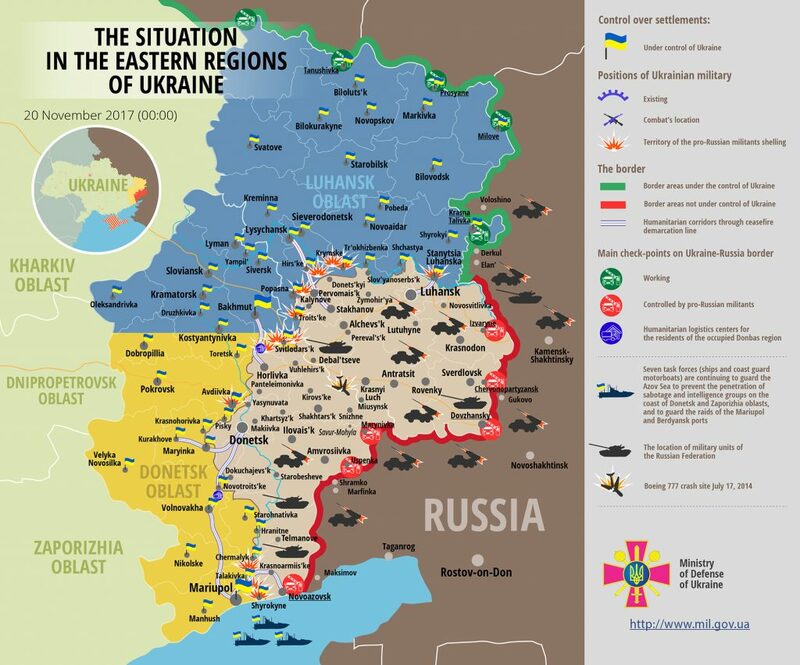 Ukrainian troops returned fire in most of the incidents. In Donetsk sector, Russian proxies conducted nine precision attacks. They fired four 120-mm rounds near Kamianka and Shyrokyne. “Moreover, Ukrainian positions near Shyrokyne and Hnutove came under fire of hostile 82-mm mortars fire. The enemy used grenade launchers, heavy machine guns, and small arms near Vodiane, Pavlopil, Kamianka, and in Avdiivka area twice,” Colonel Lysenko said. Ukrainian troops were returning fire from grenade launchers and machine guns whenever there was a direct threat to their lives. One Ukrainian serviceman was wounded in action outside Avdiivka. Colonel Lysenko also reported that on November 19 three Ukrainian troops died due to the incautious handling of a stove at a military base in eastern Ukraine. “A criminal case has been initiated and the investigation is ongoing. An investigation group consisting of representatives of military law enforcement and military prosecutor’s office is currently working on the spot,” the ATO spokesman said. Report on the military developments as of November 19 is available here. Interactive data on the shelling: chronology shelling chart and the interactive map.